The President Cristina Fernandez de Kirchner will realize on February 9 and 10 her first visit of State to Spain, where she will meet the King Juan Carlos and the chief of the Spanish government, Jose Luis Rodríguez Zapatero; she will sign agreements of cooperation and will support meetings with businessmen, they informed yesterday official sources. Gala Dinner offered by Their Majesties the King and Queen in Honor of Her Excellence the President of the Nation Argentina, Lady Cristina Fernandez de Kirchner. so it's an official visit, not a state visit, right? means we will see some gowns but no tiaras. in case of a state visit her husband nestor probably would have joined her. It´s an STATE VISIT, in the agenda of the Royal Family there are acts of a Visit of State, not of an official Visit. The King and the Queen receive her, she will lodge at El Pardo, there will be lunch in Zarzuela, Gala Dinner in the Royal Palace and Cristina's receipt to the King and the Queen. thanks lula i got confused because casa real says "Asistirán Sus Majestades los Reyes, con motivo de su visita oficial a España" and not "visita de estado". i recall that they also do lunches and dinners of honour at zarzuela / royal palace on the occasion of official visits, but without white tie dresscode. Duke, there are several elements that differentiate an official visit of a State Visit. Normally in a State Visit, the guest is lodged in El Pardo, and the King and Queen receive him there officially. The dinner is a Gala Dinner. In an official visit, they are in the habit of speaking about Official Dinner or "Dinner in honor of ". 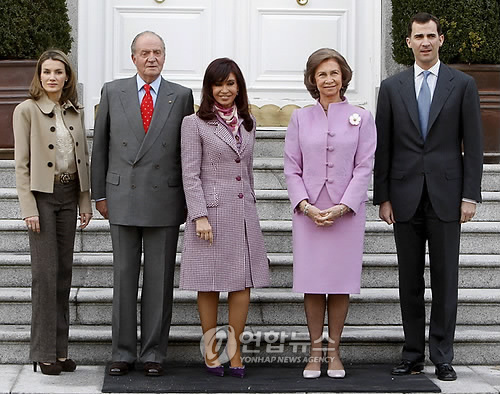 In a State Visit, the guest offers a receipt to the King the Queen in El Pardo, it never happens in an official visit. The press often commits mistakes, and the web of the Royal House is a little mad from last week. In these cases, the Agency EFE (the public Spanish agency) is the trustworthiest in the information. The Ministers' Council has granted today the Necklace of Isabel la Católica to the President of Argentina, Cristina Fernandez de Kirchner, who will begin next Monday her first visit of State to Spain since she came to the power in October, 2007.
thanks for explaining wondering why cristina is travelling on her own, without her husband. Oh I really like the Queen's suit (and the cute flower brooche). She looked really elegant. It´s nice to see some photos taken inside Zarzuela, you see them so seldom. You can see family photos at the tables. What happen to Letizia on this photo? On the photo sitting down with the Queen and the President, Letizia indeed looks like she can't stomach Cristina Fernandez at all. The others show her being presented with an Argentine order, which is of course the usual custom during state visits, but in Spain we rarely get to see the presentation captured in photos. Quite interesting - a good thing that the President's website put them up. what time did the gala dinner start?